This is an edited version of Simon’s complete Digital 2019 analysis, which you can read in full over on DataReportal. The new 2019 Global Digital suite of reports from We Are Social and Hootsuite reveals that there are now 4.39 billion people around the world using the internet. That’s well over half the world’s population. It’s also an increase of 366 million people (or nine percent) since 2018, with more than one million people coming online for the first time each day over the last year. But what does that mean for social media? With more people online than ever, there’s also more people on social media than ever—3.48 billion to be exact. And more than 9 out of 10 of those people access social media via a mobile device. Our full suite of Digital 2019 reports includes extensive insights into people’s use of the world’s top social platforms in more than 230+ countries and territories around the world. For now, here are the highlights. 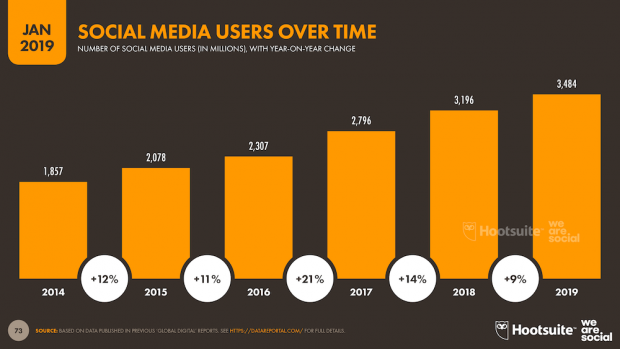 Worldwide social media user numbers have grown to almost 3.5 billion at the start of 2019, with 288 million new users in the past 12 months pushing the global penetration figure to 45 percent. Social media use is still far from evenly distributed across the globe though, and penetration rates in parts of Africa are still in the single digits. 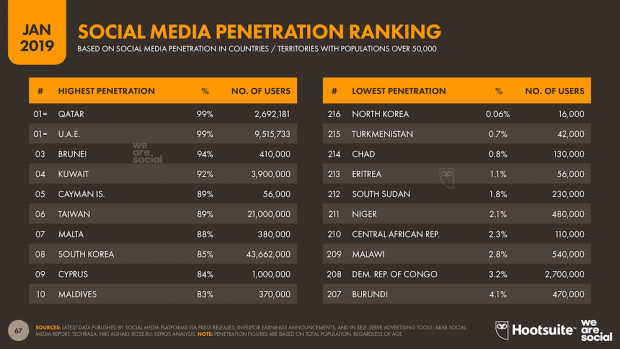 Countries in the Middle East top the social media penetration rankings, with the United Arab Emirates and Qatar tied for top spot. Most social media platforms prohibit use by children. So, we’ve also analyzed what we’re terming ‘eligible penetration’—i.e. social media use amongst adults aged 13 and above—to get a more accurate idea of social media’s global penetration. 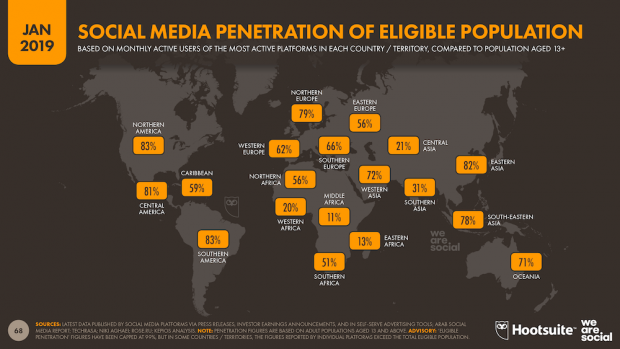 The number of social media users around the world at the start of 2019 equates to roughly 58 percent of the total ‘eligible population’, but this figure rises to more than 70 percent in almost 100 countries around the world. 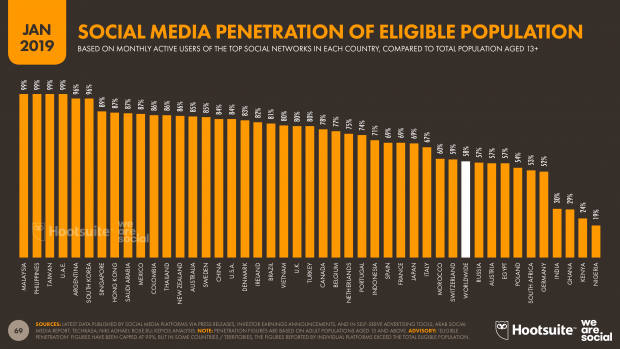 Even when adjusted for age, social media penetration in many parts of the developing world still lags below 30 percent, and 16 countries around the world still register less than 10 percent eligible penetration. Cuba and Ethiopia have witnessed strong social media growth this year. China added the greatest number of new social media users over the past 12 months, with the country’s total rising by close to 100 million new users since this time last year. India also saw strong growth, with more than 60 million users signing up to social media for the first time during 2018. The total number of global social media users has almost doubled since our Digital 2014 reports. 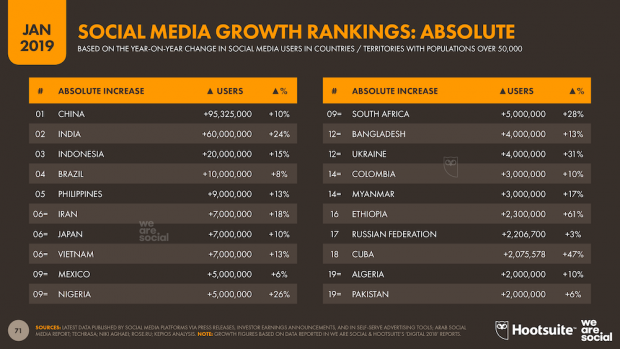 The global social media audience has matured considerably over the last five years, with people around the age of 30 now accounting for the largest share of the world’s social media users. 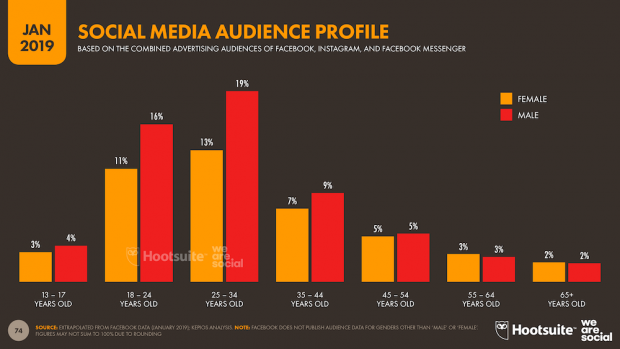 Senior audiences are now better represented too, and Facebook’s various platforms report a greater number of users over the age of 55 than users below the age of 18. There’s still a meaningful gender imbalance across overall social media audiences too, but this varies from platform to platform. 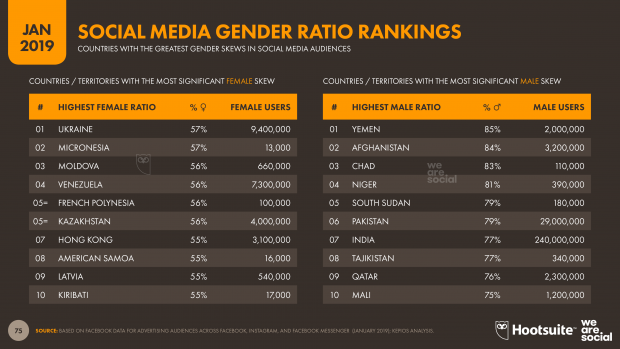 In general, countries with the lowest overall social media penetration are also those countries with the greatest male skew. As an essential resource for education, financial inclusion, employment and empowerment, ensuring more equal internet access for women must be a priority for the next phase of internet development. GlobalWebIndex reports that the average social media user now spends 2 hours and 16 minutes each day on social platforms—up from 2 hours and 15 minutes last year—which equates to roughly one-third of their total internet time, and one-seventh of their waking lives. 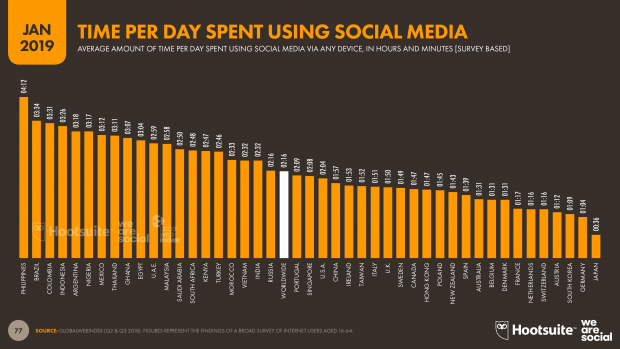 People now spend 40 minutes—and 40 percent—longer each day on social compared to this time in 2014. 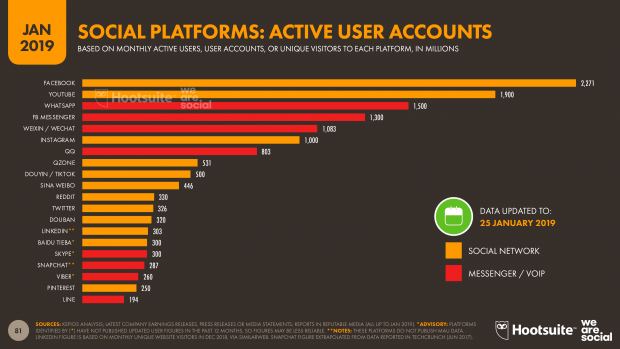 The average user now has an account on almost nine social media platforms, but they don’t necessarily engage with every one of these accounts each month. People are also increasingly using social media for work activities, with almost a quarter of users saying they’ve done so in the past month. Despite a troubling year in 2018, Facebook maintains its top platform ranking in early 2019, and people don’t seem to be leaving the platform in any significant numbers. In fact, Facebook’s monthly active users (MAU) numbers grew steadily across the past 12 months. YouTube comes in at number two in this year’s rankings. It looks set to be the next social platform to break the 2 billion user mark. Instagram and WeChat (Weixin in China) both joined the prestigious “billion users club” over the past 12 months. Twitter had a disappointing year in 2018, losing 4 million users over the last year. 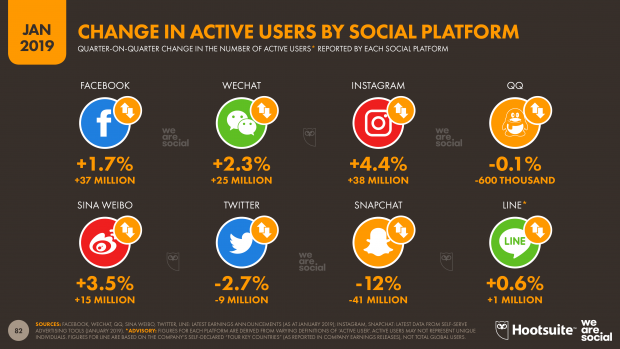 However, China’s Sina Weibo has proven that microblogging definitely isn’t dead, with the platform reporting user growth of almost 20 percent over the course of the past 12 months. Snapchat’s user base is also in steady decline. The platform’s advertising audience has seen significant drops in recent months. 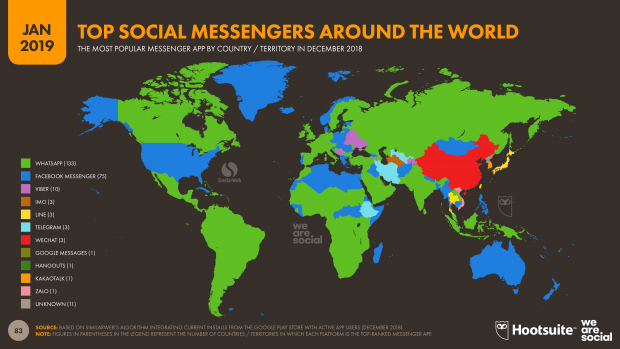 The latest data from SimilarWeb show that either WhatsApp or Facebook Messenger is the most-used app in 208 out of a total of 234 countries and territories for which they have data. Viber is the top choice for Android users in 10 countries across the globe. However, both WeChat and LINE have yet to gain popularity outside their home countries. 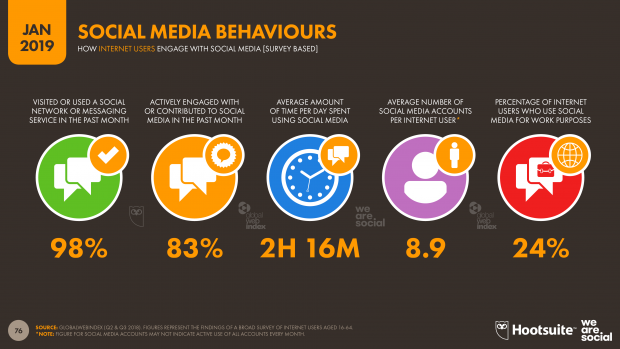 We’ve highlighted a small selection of interesting social media data for this post, but it only represents a sliver of the data you’ll find in the complete suite of 2019 Global Digital reports—which analyzes all the individual social platforms in detail. It also covers global internet and mobile usage growth, including all the essential numbers social teams need to understand current internet, social media, and mobile behaviours all around the world. Download the 2019 Global Digital reports for free here. If data and charts aren’t your thing, check out the 2019 Digital Yearbook for the most important local headlines. 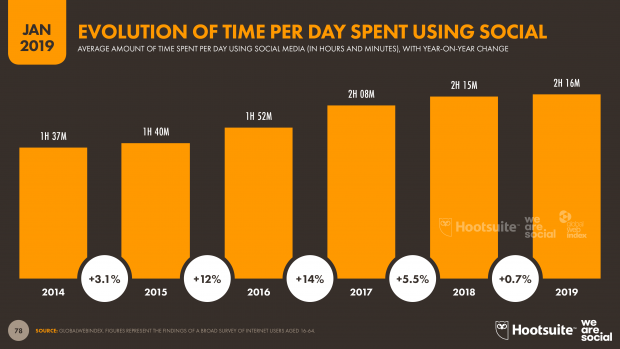 The post People Spend 1/7 of Their Waking Lives on Social Media (and Other Stats) appeared first on Hootsuite Social Media Management.